Spencer takes the school bus to the pool two days a week for swim practice. It's his responsibility to pack his swim bag so issues do arise. Today I got the phone call at 3:08 pm. "Mom, I forgot my swimsuit. But it's OK because I grabbed your black shorts by accident and I think they will work." "My Mizuno black capris? 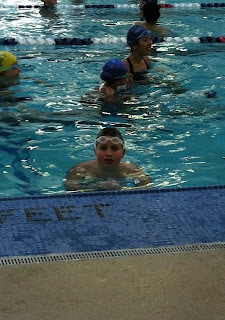 Spencer, you can't wear those in the chlorine! (exasperated sounds of me imagining my beloved favs in the community acid bath) .....BLAH BLAH responsibility....BLAH BLAH be more careful..... YAK YAK pay closer attention!!! SHEESH!! See if they have a swimsuit you can borrow and call me back." "Well it's all OK because it turns out my swimsuit was also in the bag." Doh! I felt about two inches tall. Not my greatest display of mom patience and understanding considering all that black stuff hanging up in the laundry room really does look the same. I should just be glad he's getting out there doing stuff that requires black stretchy stuff. For some people, backing off structure in the off-season works well, but I've tried it and found that it really messes with my psyche. I need a certain amount of routine. The only thing that is fairly loose right now is running - it's all easy (or meant to be) and just focused on getting out there to maintain some base fitness and enjoy. The work for Boston starts right after the holidays!